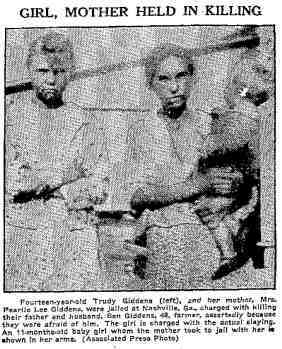 On March 2, 1936 Truby Giddens shot and killed her abusive father at Ray City, Georgia. Stories of the sensational killing made the national news and were published in papers all across the country. Girl Says Fear Caused Her To Shoot Her Father at Ray City. NASHVILLE, Ga., March 2. – A 14-year-old Georgia farm girl and her mother were charged today with killing her father in his sleep under a plan made assertedly because they were afraid of him. Both the girl, Truby Giddens, and her mother, about 40, were jailed on a murder charge but Sheriff O.L. Garner said the daughter was accused of the actual shooting. “From what they have told me,” Sheriff Garner said, “they planned the whole thing out. “The girl and her mother told me they were afraid of Giddens and that he had been mean to them,” he added. The father, Ben Giddens, 48-year-old farm laborer, was asleep on a porch at the home. Sheriff Garner said the girl told him her father had been drinking but added he detected no odor of liquor about the body. After the shooting, which took place Sunday, the sheriff arrested the mother and daughter at a neighbor’s house. Giddens, the sheriff said, worked for a south Georgia landowner as a “handy man.” The shooting took place near Ray City in the rural souther part of the state. “The girl told me she had never been to school but two days in her life,” the sheriff said. Funeral services were held at Ray City today. Beside the widow and daughter, nine children survive.